In real life and up close, there is no doubt which tank looks more dangerous. Bigger looks better, and Cats can be more than twice the weight of a IV or Sherman. Furthermore, I believe you may be ignoring both the IQ and experience of the PBI after a few weeks of combat. While a small proportion of veterans might possibly not know the difference between a 25 ton Mk IV, and a 70 ton Tiger 2, most would. There is no evidence that the Cats ever had any real effect on the outcome of WW2, bar make it end a bit sooner. Nick, I'll remind you that in the post of mine you quote, I made a point of both distance: 2-300(+) yards/meters, i.e. about 2-3 football field lengths away and also obscured by covering terrain. I was also commenting on relative size, up close, of the Tiger I (not II) versus the Sherman M4. I'm not disputing that side by side, the Tiger I is a bit larger in size than the Sherman. Increased weight is implied, but Shermans would be in the 30-38 ton range (depending upon variant) and Tiger I about 50 tons. Regarding silhouette, the lines and contours of the Tiger I (Mk. VIa) and a Mk IV with skirt armor are very similar and at DISTANCE they could be readily confusing, especially if one only has a brief glimpse. The longer barreled 75mm of the Mk IV (F2 onward) also had a near 50% greater range and effectiveness over the short barrel 75mm of the Sherman which makes it as difficult to get up close to as the Tiger I. Point is I'm talking about likely combat engagement conditions and ranges, not parade ground or museum side-by-sides. Also I was mentioning the Tiger I. Obviously, the Tiger II (Mk VIb) has a significantly different appearance/silhouette compared to the Tiger I and about 20 more tons in weight. The Panther (weight about 45 tons) also has a significantly different appearance/contour compared to the Tiger I. I was referring to only one "cat", not all of them, and that one having a very similar contour to the Mk IV. Either you didn't grasp that my comparison was just between the Tiger I and Mk IV H, AT DISTANCE & within covering terrain, or you are just letting your long-term animosity towards me get the better. Who or what is a Mick Kenny? He's a bloke who knows more than most about Jerry's big cats. "We stonked them with 25pdrs and blew the camouflage off, I still wasn't sure what they were till we took the village and found a Tiger broken down and abandoned." That old bloke , long dead now, was one of my Heroes. There was almost no chance that any PBI saw any type of Tiger. They were too rare. There was also no evidence any type of Tigerphobia was real. Tigers were far too rare to make an impact in the ETO. The only tanks that may have had an actual Tigerphobia effect were the Matilda 2, T-34 and KV-1. These tanks had their effect prior to 1942. Just an aside from the thread topic. banana importers like Geest in the 1980s converted their banana boats into cargo liners with quite luxurious accommodation for a limited number of passengers who wanted a cruise to some of the less tourist infested parts of the Caribbean. If you came over in a banana boat these days you'd have had to have a bit of brass in your pocket. I did say 'OLD'!! Ken Burt. You know more than anybody that 88's were unimportant on the battlefield in 44. You know they were not there in any significant numbers. 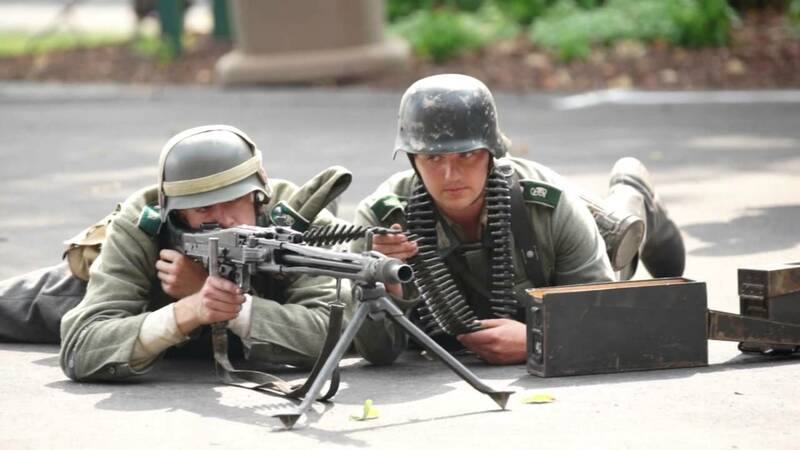 I believe the MG 34, 42, and 44 had a more psychological effect. "That's the sound of the notorious German MG 42. Sounds bad, right? Don't worry. It's bark is worse than it's bite." Guys, I think Nick is trying to be humorous and sarcastic, (so I hope). The 88/ 56 as an antiaircraft gun was relatively common on battlefields in 1944, particularly when the Germans were on the defensive in a static position. The Luftwaffe deployed large numbers of them and frequently had large stockpiles of ammunition for their guns. Flak had become the major and most important arm of the Luftwaffe in terms of defense of the Reich. So, while the Heer and SS deployed few 88 guns-- mostly the 88/71 antitank gun in corps or army level separate battalions-- the Luftwaffe was putting dozens and dozens of 88/56 into the field for air defense. Because of the availability of ammunition, these guns were frequently used as impromptu artillery. There were two flak corps (III and IV) in the West from D-Day on and between them had between them about 100 88's in the field depending on the exact time period you look at. That doesn't include static batteries, which could easily double the number of guns encountered. This is particularly true if Allied units were advancing against targets bombers attacked or routes that bombers flew to get to their targets. 502nd Tiger battalion (in AGN) was very dominant in its under-resourced sector. This unit produced numerous "aces" with some of the largest numbers. The Russians and Americans do something similar in their reports- constantly throwing around the word Tiger when it's not a tiger.